War Tortoise is Foursaken Media’s epic shooter that combines idle clicker with tower defense. 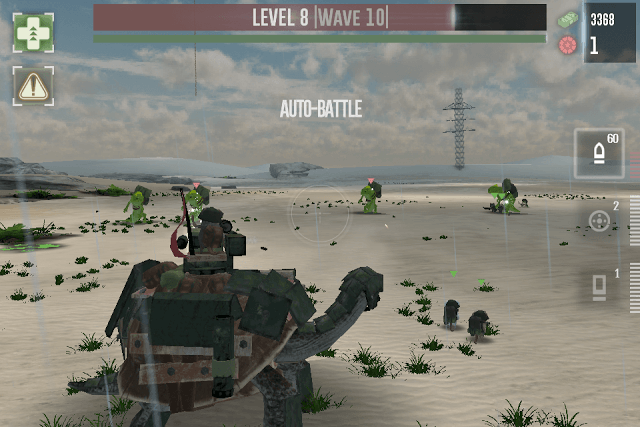 You can control a machine gun, sniper and a howitzer mounted on a tortoise. Yes, a TORTOISE. You will also be able to recruit special assault mice and place additional towers to keep anthropomorphic enemies at bay. 1. Switch to auto-battle mode and your tortoise will automatically target and eliminate incoming enemies. With auto mode on, the accuracy is reduced, but it does the work and most enemies are destroyed before they get closer to your units. Your primary weapon i.e. the machine gun will automatically target the closer enemies first and then go for those that are farther away. 2. Don’t just sit back and enjoy auto battle, keep upgrading your main unit and support units to increase the overall damage output. Once you have 800-1000 bucks in your account, try to increase your machine gun’s Damage, Critical hit and the rate of fire stats. Rate of fire plays a crucial role in auto-battle as your machine gun will fire at a faster rate than before. Keep upgrading it along with “Damage” to quickly eliminate incoming enemies faster. 3. Smaller enemies will advance in large numbers and so installing at least two gun towers on both sides of the tortoise and increasing the mouse assault/gunner squad size can help you a lot in destroying incoming enemies faster. Don’t forget to upgrade them from time to time. 4. Your priority should be to upgrade your gun towers’ “Damage” and “Range”. Longer the range of your gun tower, easier it would be to kill enemies before they get closer to the danger line. Having two towers and two mouse gunners will take care of incoming enemies, including high HP enemies in the beginning. But try to upgrade each support unit and weapons mounted on the tortoise to destroy waves quickly before they start attacking. 5. You may choose to recruit allies, but select those that can assist you in eliminating incoming waves faster. Melee recruits like Mouse Assault Squad can keep enemies busy while your primary weapon and gunners will take them down one by one. However, they can easily fall prey to stronger enemies, so make sure you keeping upgrading their health and armor, and don’t forget to increase their damage. 6. Mouse Gunners are stationary creatures that will attack anyone who comes within their range. They can be very handy to take down fast-moving enemies. Upgrading their Damage rate can be a great help to reduce enemy’s HP faster. 7. The game provides an option to start from scratch by way of a unique “Generation” system. You can advance to a new generation, but it will reset all upgrades. But you will receive more starting cash and your total damage output will also increase drastically. Not only there will be an increase in cash and damage, but it will also unlock more support units, which you can purchase later when you have accumulated enough cash. Because of the damage boost you get once you advance to a new generation, you will complete all previous levels in no time. 8. Having support units increases your overall damage output; this will help you in future in case you have moved to a new generation. You will have to recruit support units again, but since the “Global damage output” will increase by a certain percentage based on your current level progress and your best levels, your primary weapons and recruited units will deal more damage to your enemies than before. 9. Purchase extra primary weapons like Howitzer and sniper. They can be very useful against high-HP enemies. In case you have switched to auto-battle mode and there are a few large high-HP enemies approaching, you just have to tap the sniper icon to snipe them down or the howitzer icon to blow them apart. These two weapons take time to reload, so use them carefully. You can decrease their reload time, increase ammo and damage to get optimal advantage in battle. 10. Secondary weapons like the mortar rack can do additional damage to enemies. Mortar rack has a low accuracy rate, so consider increasing the blast radius so that more enemies are destroyed on impact.